Hellllllooooo changing seasons!! The transition into spring can be a tricky time to figure out where to go adventuring. Summits are still snowed in, trail conditions can be challenging, and many roads haven’t yet been cleared or repaired from winter storm damage. Eager for an adventure and want some warmth after a long winter? 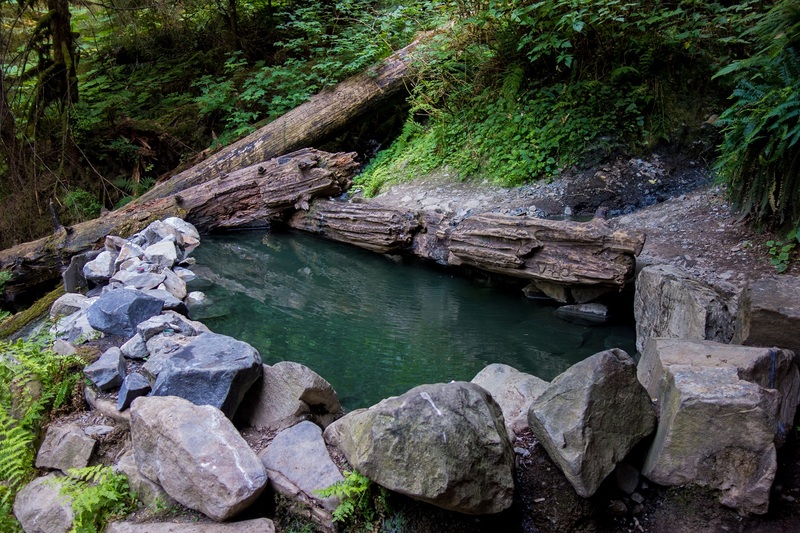 Consider a visit to one of Washington’s soothing natural hot springs! 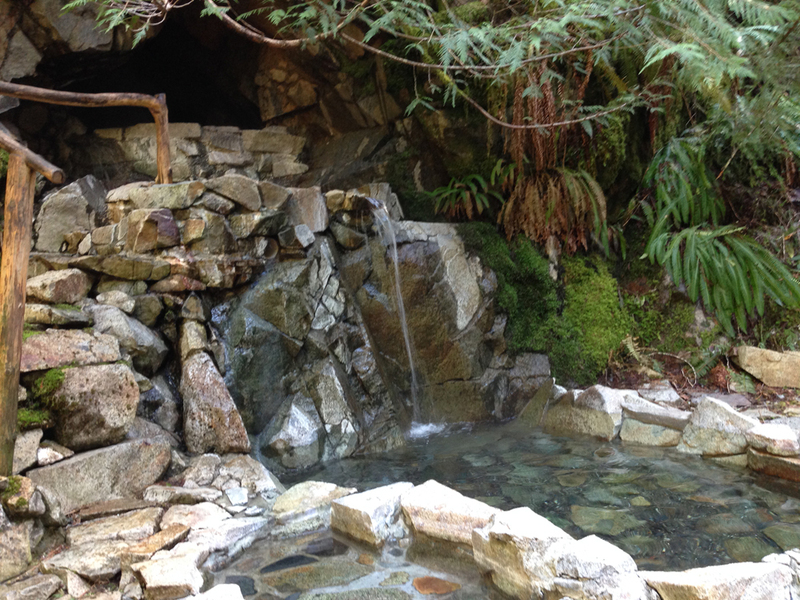 Hot springs have been used as a natural medicine and preventative therapy for centuries. Their high water temperature is rich in minerals that can increase blood flow, circulation, and metabolism and is known to relieve the symptoms of skin conditions, arthritis, and fibromyalgia. As an arthritis sufferer, I always feel incredible after a hot springs soak! The following three springs are a few hours drive from Seattle and each one is unique depending on your preference for adventure. Happy hot springs soaking! Seeking a straightforward, family-friendly outing? 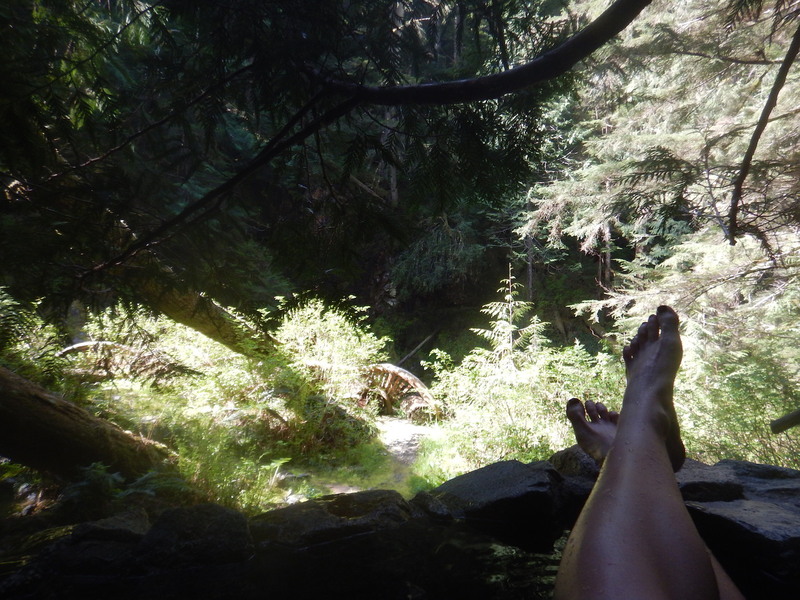 Plan a trip to the casual Sol Duc Hot Springs Resort on the Olympic Peninsula. 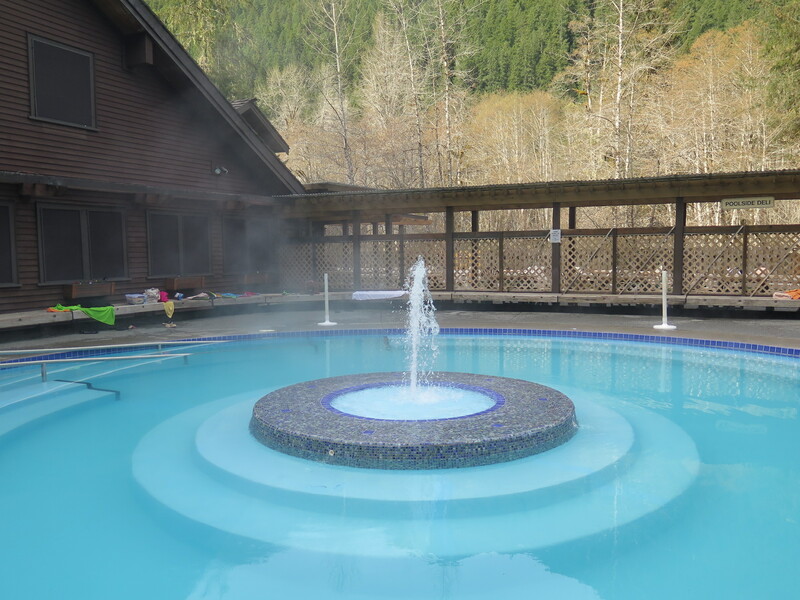 Located 40 minutes west of Port Angeles, the resort is open from late March until mid-October and offers access to three mineral pools ranging from 99-104°F and one freshwater pool varying seasonably between 50-85°F. Each mineral pool is closed twice daily for a resting period to ensure health and safety and is drained nightly for cleaning. 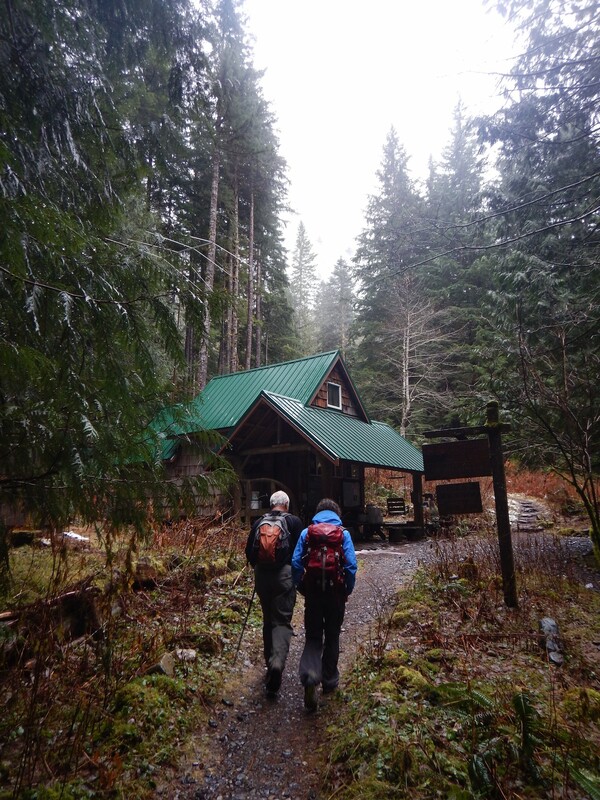 Visiting Sol Duc is certainly doable as a long day trip or you can make it a longer stay by reserving one of their cozy and comfortable 32 cabins. The resort offers dining, a gift shop, massage services, and a small grocery store. 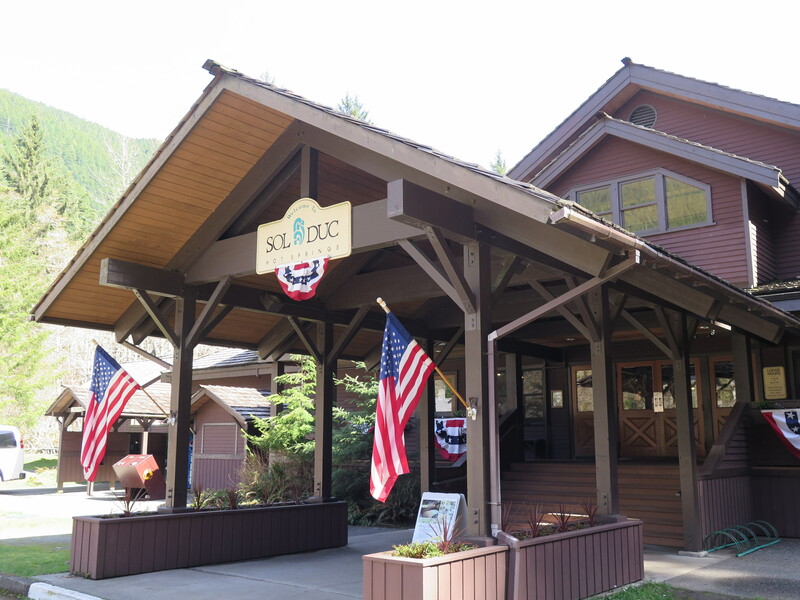 If you decide to stay, know that Sol Duc is more casual than a 5-star resort experience. There are no TVs, radios, telephones, or internet here. The perfect place to unplug, relax, and soak! Cute and cozy cabins on the grounds of Sol Duc Hot Springs. A beautiful and comfortable place to spend a few days and unwind! 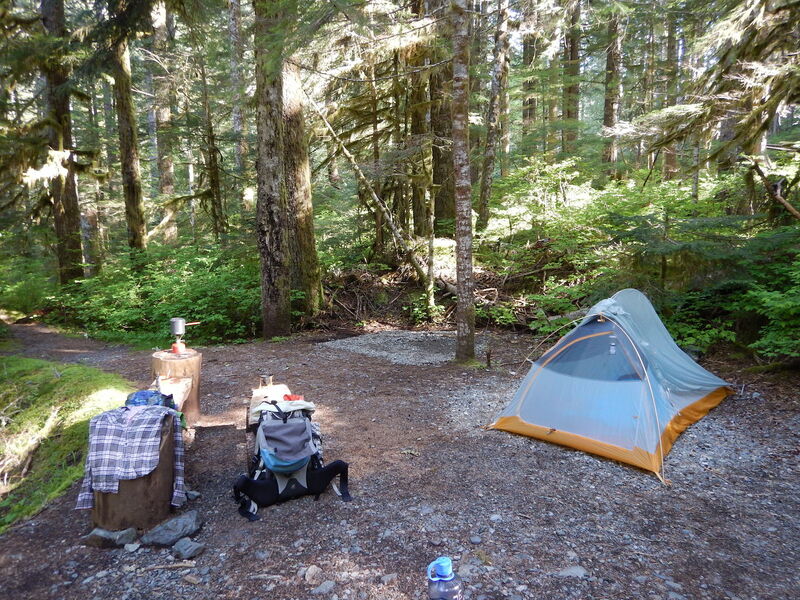 Located inside Olympic National Park, there are plenty of hiking opportunities nearby and a tent and RV campground is located only a few minutes walk from the springs. If you visit, don’t miss the 6 mile Lover’s Lane Loop hike to the beautiful Sol Duc Falls. 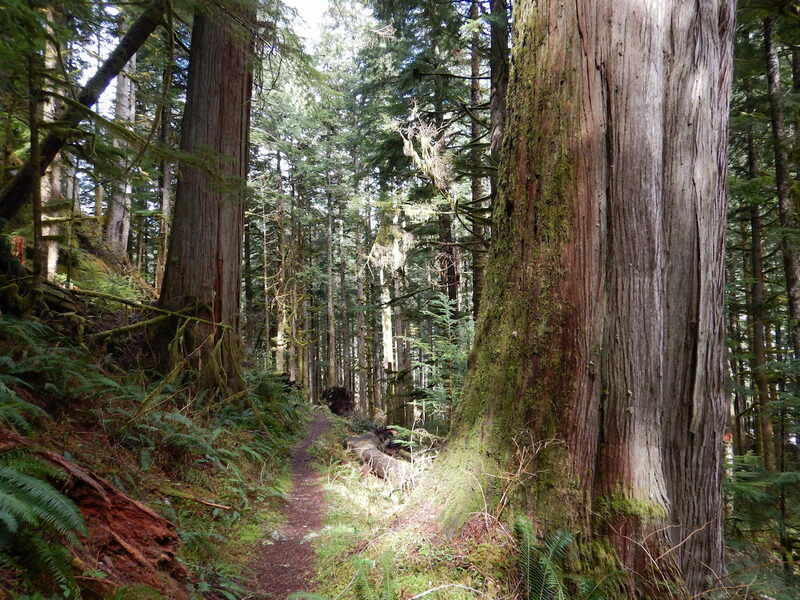 The trail winds through old growth forest and it’s easy to trip over your feet as you look up at the towering trees. The forest seems so prehistoric you can almost imagine that you’re walking with the dinosaurs. 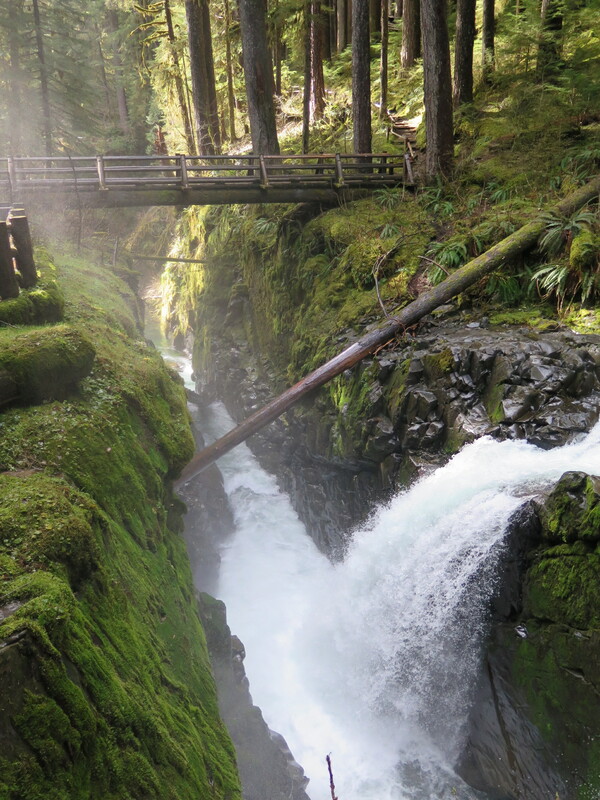 Beautiful Sol Duc Falls: a must see if you’re visiting the hot springs. The 6 mile round trip hike has minimal elevation gain. You can drive to a closer trail head and make it an easy walk but then you miss all the magnificent forest! The original Sol Duc resort was built in 1912 and was considered one of the most elaborate health resorts in the country. The 165 room hotel attracted as many as 10,000 guests each summer, some making the trip from as far away as Europe. 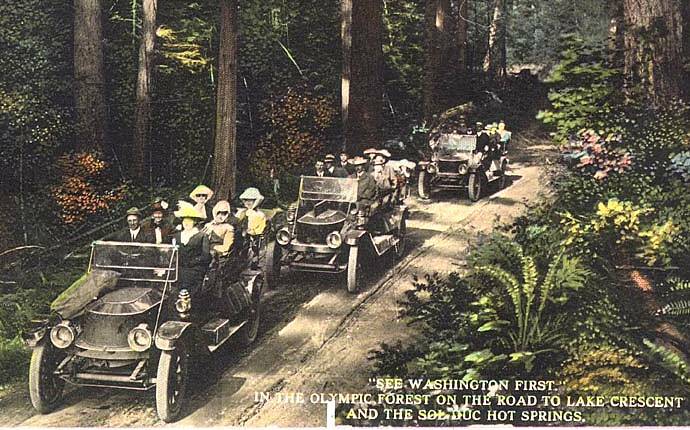 To reach the resort back then it took a 6 hour, 75 mile steamship trip to Port Crescent, a 20 mile auto stage ride to the east shore of Lake Crescent, another steamboat ride across the lake, and finally, a 14 mile Stanley Steamer auto drive. Whew! That’s quite the trip! Photo: HistoryLink.org. Back in 1912, Stanley Steamers transported patrons to the springs after several steamboat rides. Talk about an epic trip! In 1916, sparks from a defective chimney flue ignited the resort roof and in just a matter of hours the whole property had burned to the ground. Over the years additional cabins and buildings were constructed and in 1966 the National Park Service purchased the resort and incorporated it into Olympic National Park. In the 1980s the facilities were completely rebuilt. Sol Duc can be busy in summer so consider an early season or weekday visit. I visited on a week in April of 2016 and though it was still a bit busier than I normally prefer, the crowds were relaxed and there was plenty of space to enjoy the pools. Note: As of early 2018, the Olympic Hot Springs Road is once again closed due to washouts. You can still reach the springs with a 10.9 mile one-way hike on a temporary access trail. The road had been reopened briefly in 2017 after being closed in 2015 for storms. 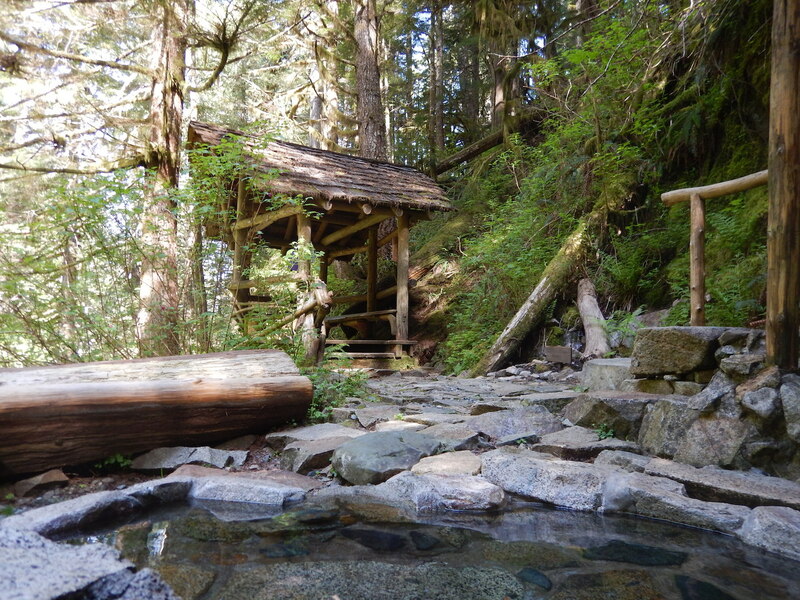 Also on the Olympic Peninsula not far from Sol Duc are the undeveloped Olympic Hot Springs in the Elwha Valley. The springs consist of 21 seeps scattered along the Boulder Creek tributary of the Elwha River, 7 considered large enough for soaking. Most range from lukewarm to 138°F and are primitive and shallow. The first few springs are generally pretty easy to find, but it takes some scouting to find the rest. These remote springs were first discovered in 1892 and in 1909 a resort was built and operated on the property. Not many know that this legendary destination operated until the National Park Service lease expired in 1966. Since then the buildings have been removed and the springs have reverted to being unmaintained. After a 3-year closure, the Olympic Hot Springs Road reopened in late 2014, only to be closed in November 2015 from storm damage. The road reopened again in August 2017 but as of April 2018 is again closed after winter storms. The Elwha campground remains closed indefinitely and the Altair campground is now only open for day use. A temporary access trail detours around the washout, but expect any kind of conditions! Photo: National Park Service. The Olympic Hot Springs Road was damaged during a November 2015 storm and briefly reopened in 2017, but remains closed again in early 2018. Do be aware that Olympic Hot Springs is unmaintained and can fail water quality standards during summer and periods of high use. Soak at your own risk. If an adventurous, natural, unmaintained hot springs experience is what you’re looking for though, this one is a great option! For the ultimate hot springs experience, the privately owned Goldmyer reigns supreme. Anyone who knows me is well aware of how much I love this special place! Remotely located in the Upper Middle Fork Snoqualmie Valley 25 miles northeast of North Bend, Goldmyer is graciously operated by a nonprofit wilderness stewardship. Caretakers live on the property year-round and meticulously maintain its cleanliness and beauty. The gorgeous Goldmyer Hot Springs! Visiting Goldmyer requires a capable 4×4, a good sense of adventure, and advanced planning. Visitors are limited to 20 per day and reservations are required. Weekends and holidays can fill up months in advance. Oftentimes you can show up on a less busy weekday and get lucky, but the journey isn’t easy so I would highly recommend making a reservation. Reaching Goldmyer used to mean surviving a 16 mile bone-jarring, kidney-bruising drive on the rough and potholed Middle Fork Road to the Dingford Creek Trailhead. But ah progress. A paving project has now made the first 10 miles of this once great adventure a little less exciting. 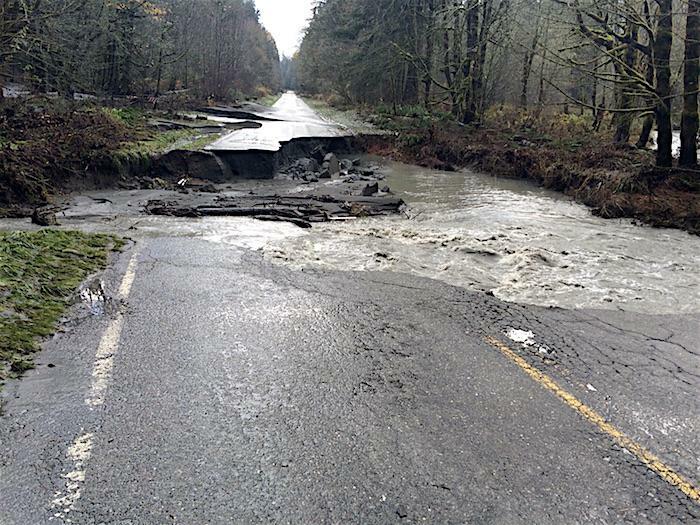 Don’t be fooled though, once you pass the Middle Fork Campground, the remaining 6 miles of forest road to Dingford require high-clearance and during inclement weather, can be impassable. The road to Goldmyer can be an adventure. In 2015 some friends and I were stranded when heavy rains washed out the road between Goldmyer and the Middle Fork. We returned a few weeks later to help the hot springs caretakers and crew clear out the road when flood waters receded. High clearance 4×4 required! From the trailhead, Goldmyer is a 5 mile trek by bike or foot. If biking, I would recommend staying on the forest service road past the gate. On foot, you can either hike the road or take the more adventurous and scenic Middle Fork Trail from the Dingford parking lot. The trail winds through gorgeous old growth forest. Both routes are similar mileage and you can even go in one way and out the other for some variety. 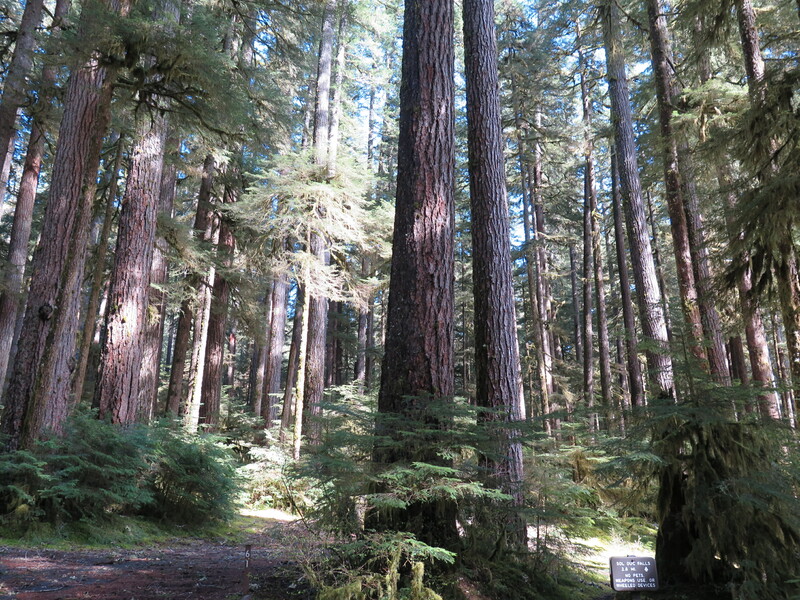 The forest surrounding Goldmyer is filled with spectacular old growth trees! 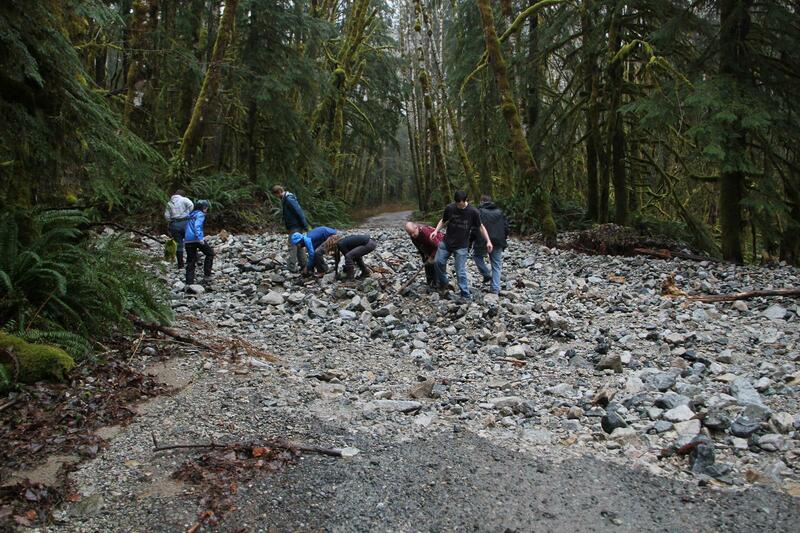 If hiking the trail, take caution on the Thunder Creek crossing during periods of high water or rain. It can be a little tricky! Mountain bikes are allowed on the trail during odd-numbered calendar days from June 1 to October 31, though negotiating Thunder Creek could be a fun exercise! The caretaker cabin at Goldmyer. Always check in with the caretakers before visiting and most importantly, make a reservation to guarantee your visit! Once on the Goldmyer property, a sign alerts you to check in with the caretakers by ringing a little bell near their cabin. Afterwards, hike a steep half mile straight up to the springs through spectacular old forest. Goldmyer’s 125°F spring source is located inside a horizontal mining shaft that keeps the ambient “cave” temperature hovering around 111°F. The spring cascades outside into two smaller and progressively cooler pools. A cold water plunge is located a few steps away for the truly brave. Float through the larger cave and find a comfortable bench in the back. Alternate between pools for a change of temperature. With the beautiful Burnt Boot Creek adding a touch of ambient noise and huge trees towering over you, the setting is sublime and it’s easy to lose track of time here! Goldmyer was first developed back in the early 1900s by William Goldmyer and operated as Crystal Hot Springs Resort. In the early 1910s a lodge was constructed and staffed for miners and loggers in the valley. In the 1920s the property was sold and the new owner, Bill Morrow, had big plans to build a grand resort with bath houses, a large swimming pool, and tennis courts. World War II halted those plans and then a large flood in 1960 destroyed any building that had occurred. Public access to Goldmyer in the 1970s led to vandalism and destruction and in 1976, the Morrow family formed the nonprofit stewardship Northwest Wilderness Programs to clean up, heal, and protect the hot springs. Thanks to the Morrow family, this nonprofit still exists today and Goldmyer has become an incredible treasure that can be enjoyed by everyone. Consider camping at the springs for an extra special multiday trip. Camp sites near the springs offer a spectacular setting for an overnight getaway and the sites are large, cozy, and comfortable. Day access to the springs is $15 per adult, $10 for seniors (65+) and free under 18. Camping spots are $5 per night. 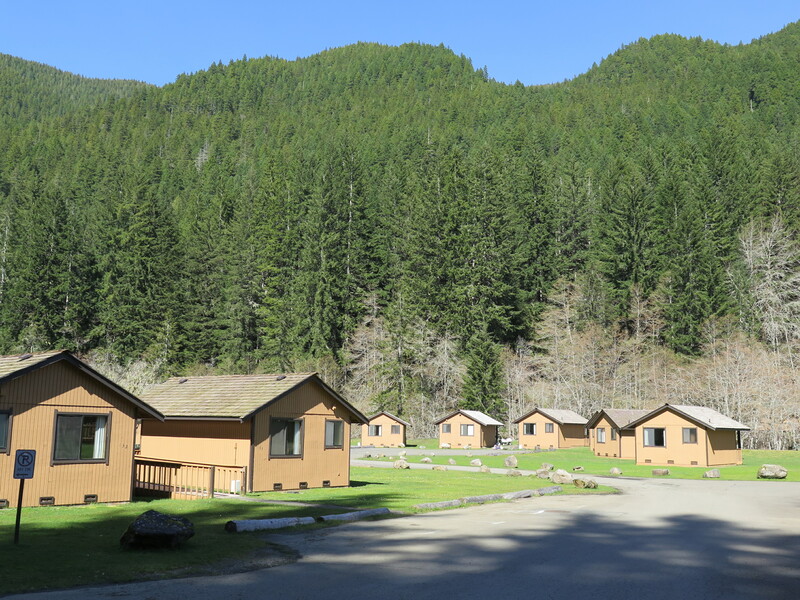 Campsites at Goldmyer are large, comfortable, and private. A fantastic spot to spend a weekend! No cell service, potable water source, or trash service exists in the area, so pack out what you bring in and don’t underestimate the trip to Goldmyer! In 2015 after visiting the springs, I had an unexpected car camping adventure with friends when flooding washed out the road. We were lucky that we had extra supplies with us and were able to stay put for a night until conditions improved and finally allowed us to exit. If you take a trip to Goldmyer, absolutely bring extra food and supplies, especially if the weather might be challenging. The Middle Fork is a wild place, you never know if you may end up spending some unplanned time there! Go visit one or all of these incredible hot springs within a few hours of Seattle and let me know how you enjoyed them. Happy soaking everyone!! Happy hot springs soaking everyone!